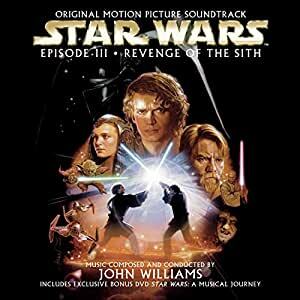 'Episode III Revenge of the Sith' features a new score by five-time Oscar winner John Williams, who is also the composer and conductor of the score for each film in the six-chapter Star Wars saga, and an exclusive collector's DVD. 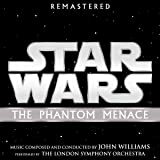 Created especially to accompany the CD release, the thrilling 70-minute DVD features 16 brand-new music videos set to selections from all six of John Williams' unforgettable Star Wars film scores and has been designed around a timeline that will take the viewer chronologically through the entire saga. Sony Classics. 2005.
product: Star Wars: A Musical Journey (1995) (V), included as bonus disc in Episode III soundtrack. The bonus dvd with this soundtrack was the reason I purchased. I enjoy film soundtracks, and science fiction, but this dvd was a real highlight for me. I got the soundtrack cd out of the local library. The cd was missing from the case, but I found this wonderful dvd instead that I went out to purchase later. With optional segments of dialog from Ian McDiarmid, this film is a stunning visual and musical overview of the full epic story of episodes I-VI of Star Wars. For those of us who felt that eps. I-III fell short of our expectations, this film presents them well as parts of the whole story. The Musical Journey also stands as a summary of the entire SW opus for someone who is not familiar with the Star Wars characters and plot. Highly recommended. Options: no subtitles or other options. WOW!! I just finished listening to the CD, courtesy of AOL's listening party. It is the best prequel score, and the best Star Wars score since Star Wars Episode V. It must be heard to be believed. We all know that the score for Star Wars Episode II was lacking. Williams makes up for it this time. My only complaint is that there isn't enough classic stuff: not enough Imperial March and I was hoping that the male choir piece that plays for Darth Sidious in Star Wars Episode VI would make an appearance. However, THIS CD alone is one of Williams' best work. The new theme, 'Battle of the Heroes' that plays throughout is awesome. One fianl note: at Celebration III it was said that next year, there might be a prequel bxed set of the complete score. So, 2 CDs for each film (Episodes I-III) makes a six disc set. I hope so, because while the prequel trilogy music is awesome, give us the complete score! As a lover of classical music and of Star Wars, I did buy this soundtrack when I heard about the bonus DVD. The bonus DVD has the "best" of the music that John Williams composed for the six Star Wars movies. 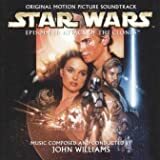 I really liked this compilation because it expands on the other compilation that I own - "John Williams Conducts John Williams The Star Wars Trilogy" (also Sony Classical). The soundtrack CD of Episode III is quite good, as well. There are hints to the "Imperial March" and to the "Duel of the Fates" throughout the musical score. I realize that some fans may not like the DVD much because the video is from the Special Editions of the original trilogy, but honestly, I only watched the DVD once but listened to it three times already. Really, isn't listening the reason why we buy a soundtrack? The CD is fantastic...one of the best scores to any of the Star Wars films. The bonus DVD is great too, especially once you've seen Star Wars in Concert live.